Wagner, Die Walküre (Der Ring des Nibelungen, First Evening). Bayreuther Festspiele, 7/28/15. Conducted by Kirill Petrenko, production directed by Frank Castorf with sets by Aleksander Denic, costumes by Adriana Braga Peretzki, lights by Rainer Casper, video by Andreas Deinert and Jens Crull, cast includes Johan Botha (Siegmund), Anja Kampe (Sieglinde), Catherine Foster (Brünnnhilde), Kwangchul Youn (Hunding), Claudia Mahnke (Fricka). If you missed it, start with my post on Das Rheingold here. Kirill Petrenko’s conducting remains the cycle’s most reliable asset. Assertive but not showy, exciting but not rushed, he led a suspenseful first act followed by a more pensive second and third. The brass were somewhat more present this evening, and the Ride of the Valkyries never gave into effect-centered kitsch. And he knows how to end an act. The Bayreuth audience deserves some credit for this, because they never, ever start clapping until the orchestra has finished (even giving a nice few breaths of silence when appropriate). But Petrenko gives us something worth hearing. The orchestra is doing outstanding work here. 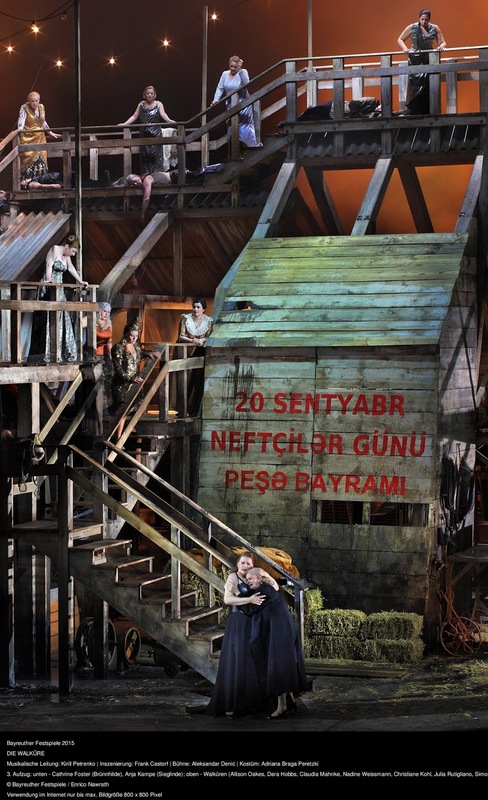 Aleksander Denic’s set is once again amazing in its rich detail, as is its construction by the Bayreuth crew. (Unfortunately it is poorly shown in these press photos.) This time it’s a barn (Act 1) which turns into an oil derrick (Acts 2 and 3). Its coup de théâtre comes near the end when a giant arm slides out on a track as Wotan puts Brünnhilde asleep and a pump starts going up and down. Yet it is less functional than the Rheingold set, and people walk around it more than they walk on or through it. 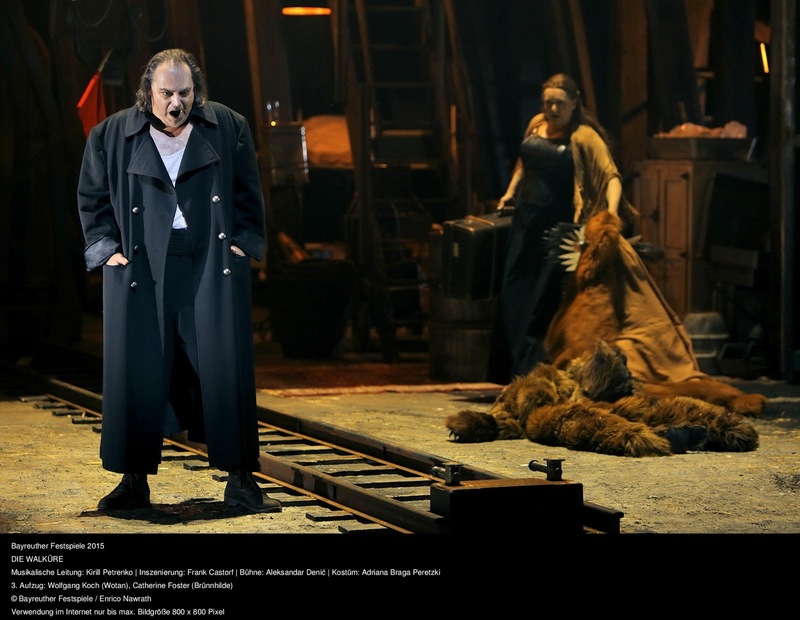 We still have live, close-up video, particularly in the second and third acts, but it is used much more sparingly than in Rheingold, where it was nearly constant. There are some gruesome bits. 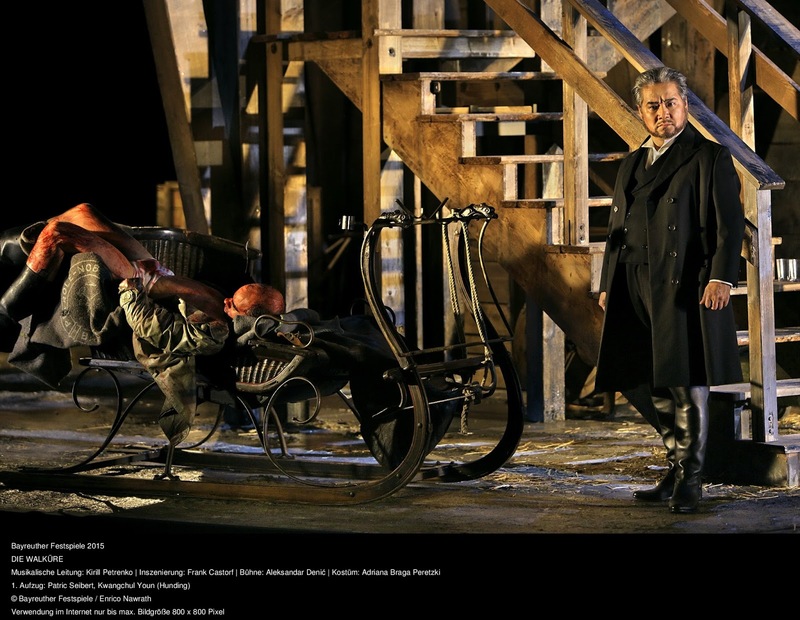 Hunding’s hunt netted him a human head (as Hunding, Attila Jun sounded fine but wasn’t, otherwise, very imposing) and why is there a man (our friend the gas station attendant from Rheingold–this is the production’s dramaturg, Patric Seibert) in the turkey coop? Along with real turkeys? But for the most part the Personenregie of this installment is non-existent. Siegmund and Sieglinde and their story don’t fit into this world, and while this could be productive the actual result is that the singers are more or less left to fend for themselves on a big, unrelated set. The result is not terribly interesting. 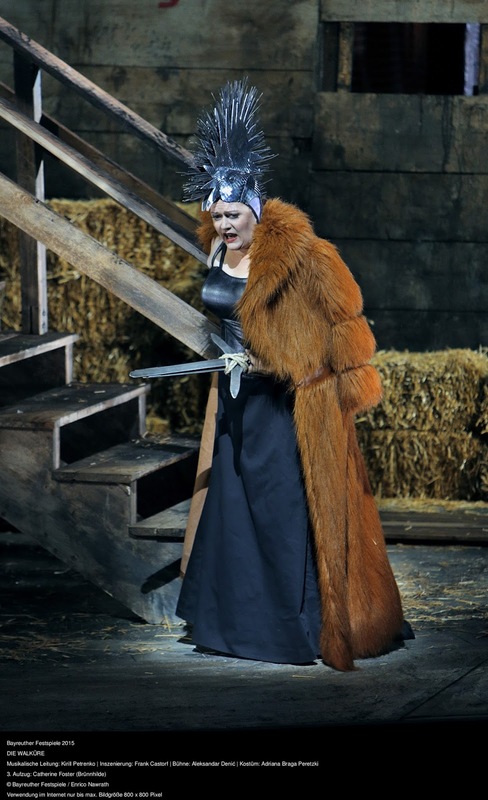 Anja Kampe is a terrific Sieglinde and one of the best actresses in this Fach, but here she wasn’t given very much to do and theatrically speaking the results paled in comparison to her Munich Sieglinde. Her Siegmund was Johan Botha, whose acting was, as usual, poor and nearly immobile. This time, however, I don’t think he was himself entirely to blame. 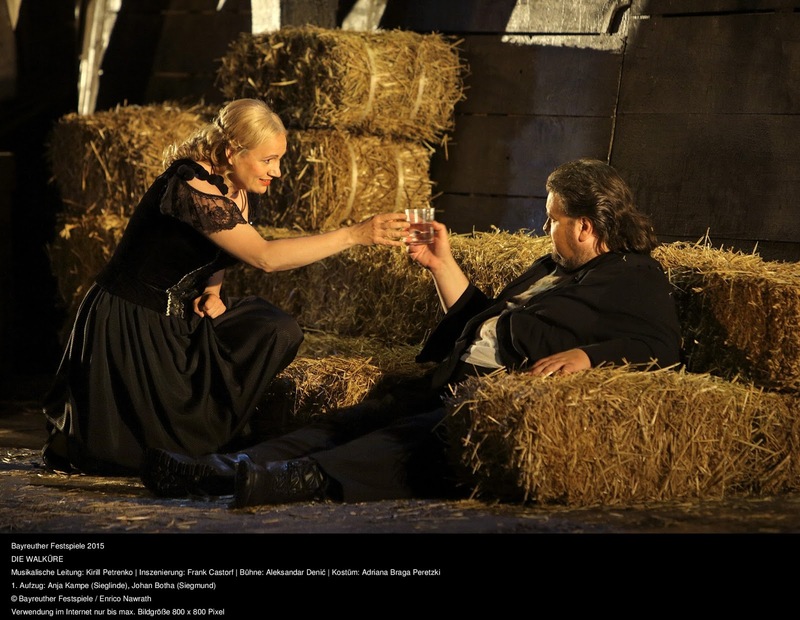 The Wälsungs nonetheless kept their end of the opera going, because both Kampe and Botha are both great singers and with Petrenko’s help their story was the propulsive narrative it usually is. Kampe always struggles with her high notes but her struggle has its own kind of pathos–you just know she’s giving it everything she’s got, even if someone else’s Herzliches Wunder might sound a little more free. In contrast, Botha can blast it all out beautifully without looking like he’s trying, including some super Wälse Wälses, and he seemed to be doing at least a little bit of thinking about the words this time. But given no broader interpretation–or subversion–by the production, the results are bland. When you’re depending on the remarkably inert Johan Botha enlivening your theatrical experience on his own initiative, you are bound to be disappointed. 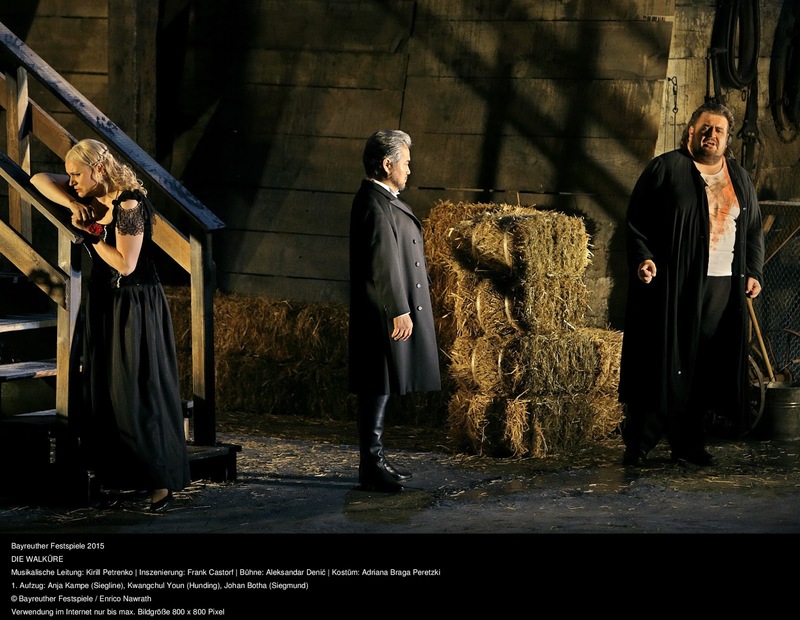 Some people may like this act, because its recourse to old-fashioned opera offers some of the theater of sympathy otherwise absent from the production. But I think it’s a case of the production failing to live up to its own terms. 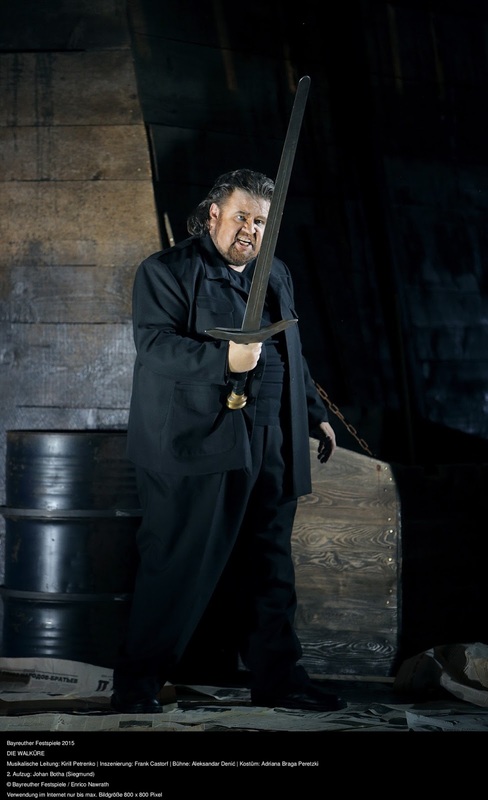 I don’t think Castorf meant to offer a mediocre standard-issue Walküre which happens to be on an elaborate set. Adolf Hitler went in hot pursuit of Baku’s oil fields. The staging stays static in the subsequent acts. 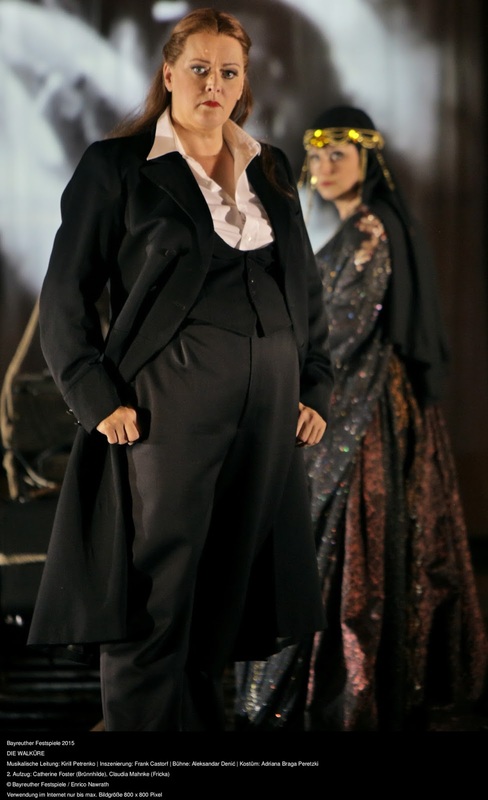 Brünnhilde first wears a suit with her hair in a ponytail, making her a strange double for Ortrud in the Neuenfels Lohengrin, also onstage here this week. Wotan sometimes has a big Marx beard, and sometimes he doesn’t. I again found Wolfgang Koch completely acceptable but not terribly exciting. He can pace himself through the whole opera, which is no mean feat, and he obviously is paying attention to the words. He can project a bitter world-weariness appropriate to this installment, but his Wotan never really took off. He just doesn’t seem to be a good fit for Castorf’s sleazy oil baron (think Daniel Day-Lewis in There Will Be Blood) idea. But the production doesn’t seem to have a vision for Brünnhilde at all. Castorf has, I am forced to admit, serious woman problems. (I gave him the benefit of the doubt for as long as I possibly could.) I’m going to talk about this in detail in my Siegfried post, but for now let’s say that Brünnhilde doesn’t act like his apparent type and he doesn’t seem to know what to do with her here. She helps her father with the work, filling bottles with something significant, and is dressed for business. But she doesn’t obviously belong in this world–and that’s no fault of singer Catherine Foster, whose performance was mostly quite impressive. She’s got a bronze, mighty voice which is stable and accurate (except some slightly sharp hojotohos). She’s particularly good with declamatory singing, where her precise attack serves her well. The Valkyries are a group of weirdly formal, almost evening-dressed women, not given a real showcase of a staging. The singing wasn’t quite there–I can’t single out anyone because I don’t know the score well enough to tell you which valkyrie sings which hojotoho, but some of the voices were a lot bigger than others, though they stayed together perfectly well. Fricka, also (again well-sung by dark-voiced Claudia Mahnke, who uses the friendly acoustic to be subtle), appeared in disconcertingly formal and detached guise, here with an elaborate headdress and robe which read as exotic East, nega in Russian. It was some of the only local color that would suggest that this is Azerbaijan and not Texas (except when Hunding pulls out what I think was a highly anachronistic copy of Pravda?). 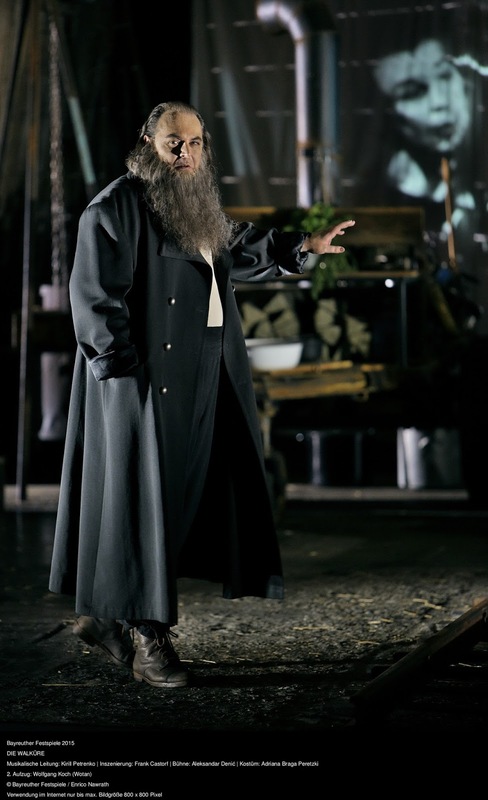 Wotan has all the oil, but other than that, who knows? Like in Rheingold, Castorf rarely abandons the big plot points. The Schwert is still a Schwert. (Non-initiates: that’s a sword. That’s THE sword.) To my surprise, there was actual fire at the end, though not exactly around Brünnhilde. This is still not a production which makes each element of the plot correspond with some relevant, setting-appropriate analogue. It’s only as good as its atmosphere. And in this respect I found Die Walküre, compared to Rheingold, lacking–particularly because it is the installment which offers us many of the strongest dramatic threads of the whole cycle, ones which are ripe for Regieification. 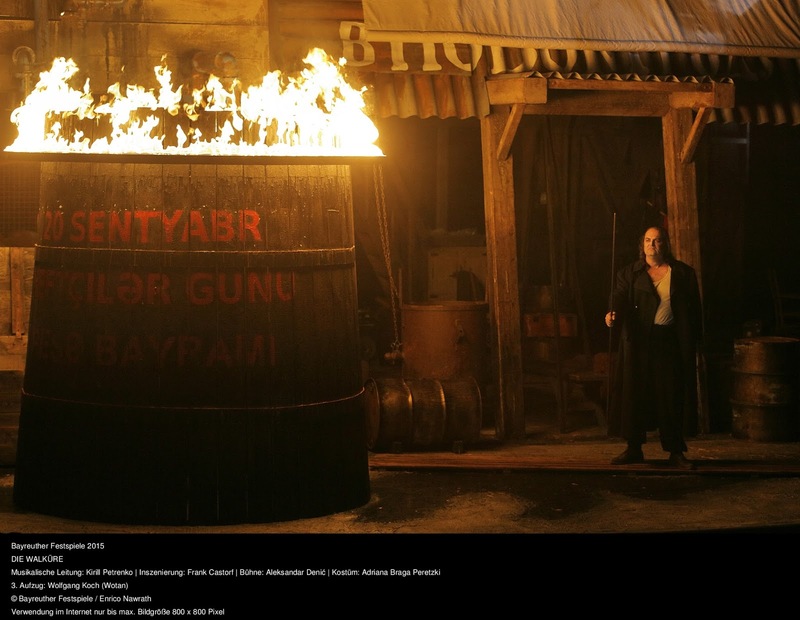 I still enjoyed the Todesverkündigung–my favorite scene in all of Wagner–and the fire music. But their lack of staging and lack of integration is frustrating. I guess leaving the Gesamtkunstwerk behind is a hard thing to do. Siegfried, as I will write about soon, took another turn. OT, but who is your favorite conductor of the ring? 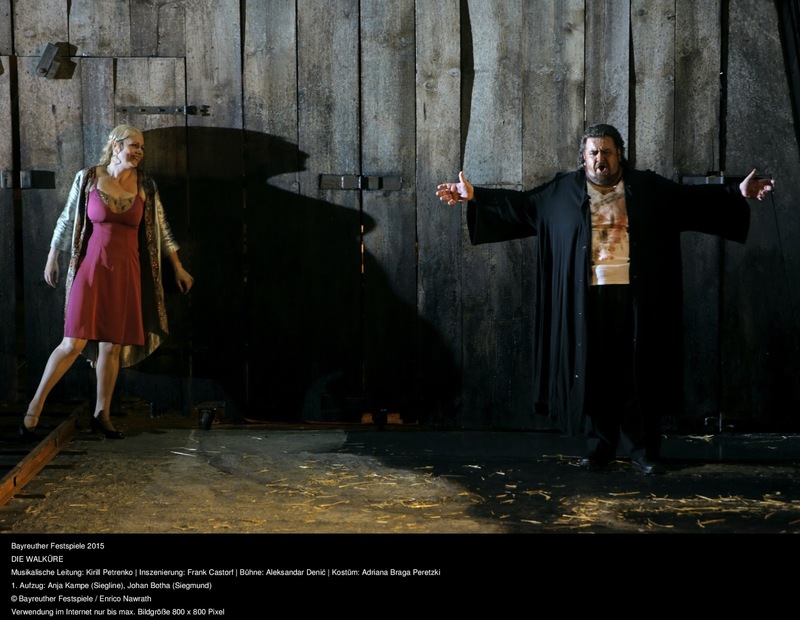 I'm actually not too taken with Petrenko myself, finding him in line with Negano and Rattle in that I think it's a bit bloodless and fleet for the more dramatic moments. Petrenko is definitely living in the same Wagnerian neighborhood as Fabio Luisi and Nagano, though I like him more. I don't know who my favorite is. For current conductors I might have to say Thielemann. I just miss a certain density that seems to be missing these days. Thielemann definitely has it and after Barenboim he's one of my favorite Wagner conductors. I'm glad Kampe did well, I was recently won over by a surprisingly excellent Isolde recording (check it out).